Love & Lentil: My Monthly Menu is back! Its been a few months since I posted my monthly menu. Some things don't happen for a reason and there were many reasons why my monthly menu did not happen for the last few months. But, its better that I don't go there lest all world know about my laziness! So, people of the world - here it is - the great big unveiling of my monthly menu!!! 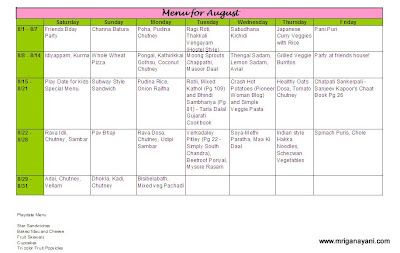 For new folks who are looking at my menu - there is only one meal listed each day as I cook only dinner. My in-laws are here and my mother in law cooks traditional rasam-sambar-rice for lunch everyday. So, I just cook the dinner. Even when she is not here, I just cook the dinner. Our breakfast is usually very simple - bread, cereals, oatmeal etc. Lunch is leftovers from previous night packed into pretty lunch boxes. And the weekends - my kitchen is closed most of the time - how else would I experience the great restaurant foods? I've tried hard to keep a balanced menu this month - added at least 1 high fiber - high nutritious meal once a week. All fridays are either chaat or fun foods - just my way of welcoming the weekend. There is also one international cuisine each week - Japanese, Mexican, Italian and Chinese. Wish me good luck and lots of will power to follow this menu everyday! Menu sounds interesting!..do update the change in this list..:)..and nice to know you get to cook only one meal..after all as you said how else you will taste the restaurant food..:))..all the best though..
Lovely menu, Mrigs. I wish somebody made all these food for me everyday! :) I like it how you make simple food and keep a nice variety in there. That is great. I make menus but I hardly follow them!